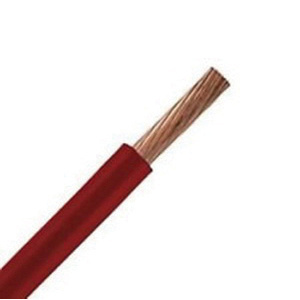 Omni Cable 18-AWG TFFN building wire in red color, has a voltage rating of 600-Volts and temperature rating of 90 deg C. This copper wire measuring 500-ft, has an outside diameter of 0.09-Inch. It features smooth outer jacket for easy pulling. The wire has 0.015-Inch thick insulation and 0.004-Inch thick jacket. It is suitable for installation in conduit, duct and other recognized raceways in wet or dry locations. The wire with small diameter, is ideal for additional circuits and large conductors without exceeding maximum fill limitations. Wire meets UL 66 - TFFN/TFN, UL 1063 and UL 758 standards.